Here's a salad wrap to make our winter days brighter. The idea of eating a salad on this very cold, blustery day was as dim as the grey, gloomy winter sky. I just made some makizushi for the kids last night. With no rice left, nor any salmon and avocados, I had a sugarloaf chicory staring at me from the fridge and my leftover cauliflower fluff (plain, grated cauliflower). I had been saving the sugarloaf chicory to use as a leaf wrap for another dinner endeavor but that moment was now. So I seized it and pulled out whatever else I could find from the fridge. Oh and by the way, cauliflower fluff is used as a rice replacement for those Paleo followers. Hmpf—I love rice too much to do that! Well, I found myself in a situation you see... and guess where the cauliflower fluff ended up? In my maki. I quickly mixed up some tahini-tamari sauce with a splash of lemon juice to dip these relishing novelties into. And there you have it, a bite size salad bursting in your mouth. Place a piece of nori flat on a bamboo rolling mat lining up the edges. Starting from the bottom up line a layer of your choice of salad greens until half way up. 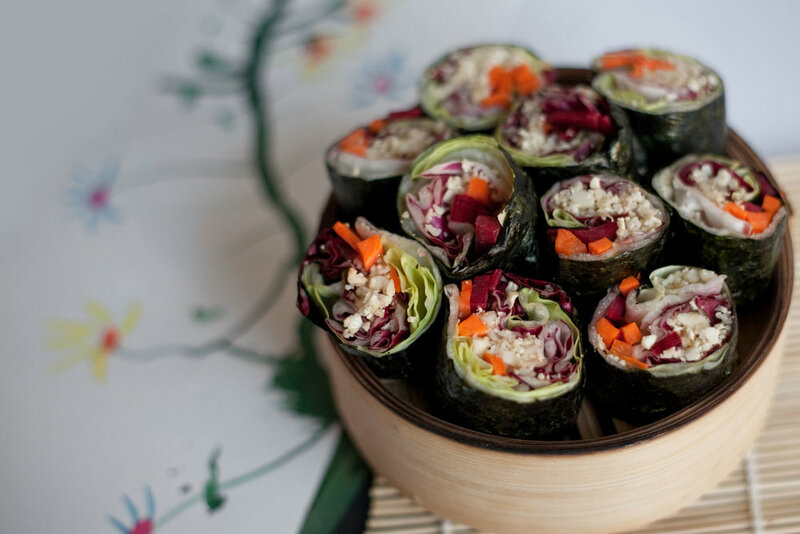 I used winter salad leaves like radicchio and sugarloaf chicory since I had it on hand and to add some color to the maki. Spread your grated cauliflower evenly over your salad greens. Then add a layer of carrots and beetroot. To roll, lift the mat up, roll and tuck in the edge of the nori. Continue to roll over the contents while applying some pressure until you reach the top. You want the roll to be tight so the ingredients don't fall out. Slighty wet the top edge of the nori with water to seal the maki. Using a sharp knife cut the roll in half, then in thirds for 6 bite size pieces.